A 2016-17 New Year Card from Belgium! A 2016-17 Christmas Card from Sweden! A crack team of HBC Members wield the screwdrivers to save all the memorabilia from The Windsor Castle, which will be closing permanently before our next First Friday meeting in September. Click / Tap on the thumbnail above to play. Foregather on Friday for a Final Farewell! This plaque will soon be in a new home! The Heron public house, Norfolk Crescent, London W2 2DN. 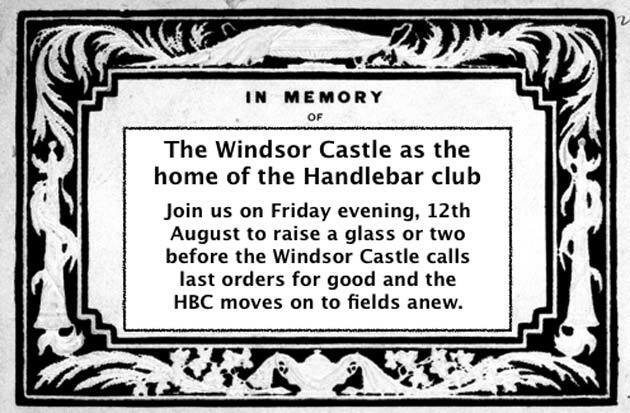 We are sad to discover that our home for many years, The Windsor Castle, will be closing permanently before our next First Friday meeting in September. However, we will be decamping around the corner (with all our club memorabilia) to The Heron public house, Norfolk Crescent, London W2 2DN. This will be our temporary home until the AGM where we can review our situation. in the Sussex/Kent area on 31st March - 2nd April 2017. Further information on venue and booking will be available nearer the date of the meeting. 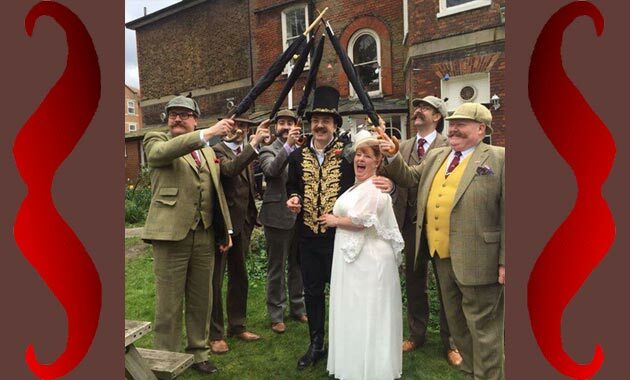 On Saturday 9th April Handlebar Club member James Dyer married Gina Webb at Ruskin House in Croydon. On Saturday 9th April HBC member James Dyer married Gina Webb at Ruskin House in Croydon. The event was attended by club members Allan Robinson, Alan Spencer, Maxime Jequier, Tom Carradine and Ryan Pike who at the bride's instructions formed a tweed and umbrella guard of honour to send the couple off in style. Tom Carradine provided a splendid evening sing-along session in his usual inimitable fashion and the club wishes the newlyweds every success and happiness together in the future. 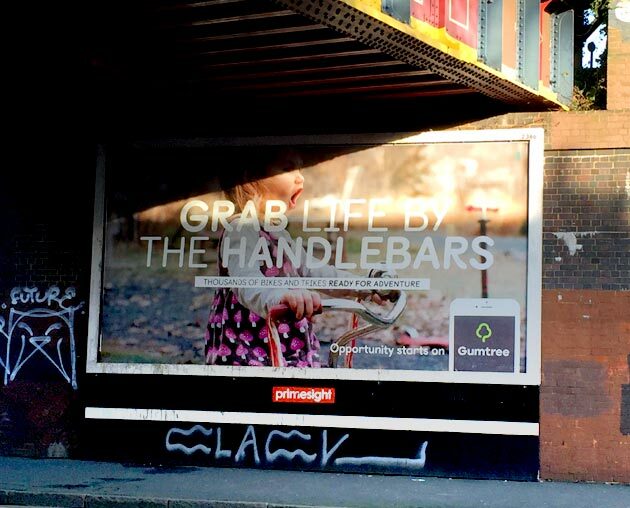 Grab Life By The Handlebars! 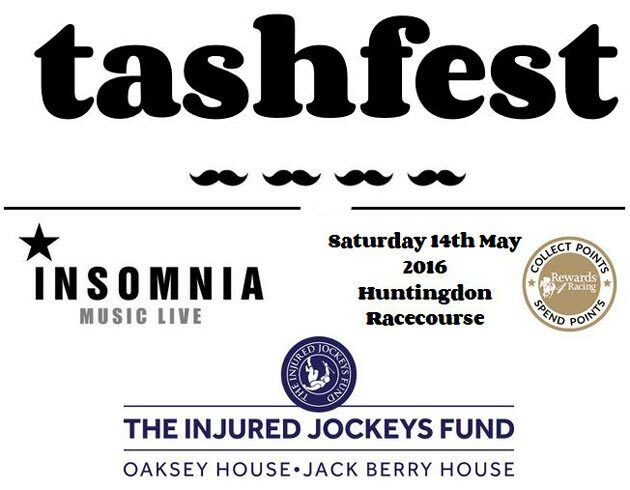 tashfest is a one day charity music festival at Huntingdon Racecourse on Saturday 14th May. Extravagant upper lipholstery is encouraged! Tickets are £25 for 7 hours of live music and free camping. The Holiday Inn at Huntingdon Racecourse is also providing a special room rate. All the information about the line up announcements are on the website. All profits will be donated to The Injured Jockeys Fund. 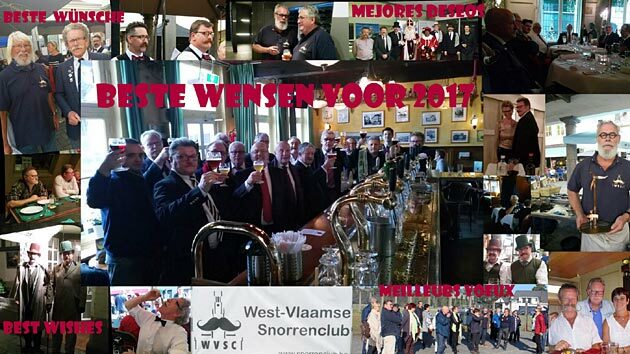 Best wishes from all the members of the Begian West-Vlaamse Snorrenclub! 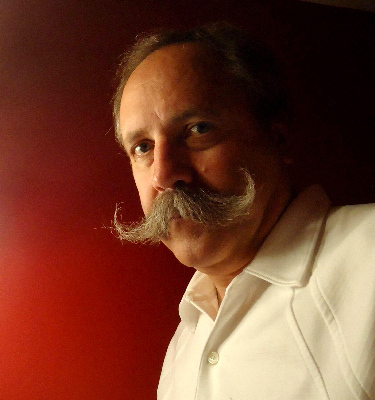 It is with heavy hearts that we have to pass on this Christmas sadness regarding the loss of a Handlebar Club Classic Gentleman whom most of us have never met, but who played a big part in the running of the internationally-known Handlebar Club Internet Forum. Gerald Klatt passed away on Monday 7th December after a year long battle with cancer. “Although Gerald lived in Kelowna, British Columbia, Canada with his wife and family, he never revealed his location or real name to the other Forum Members, except (as far as I know) to me, I am privileged to say. 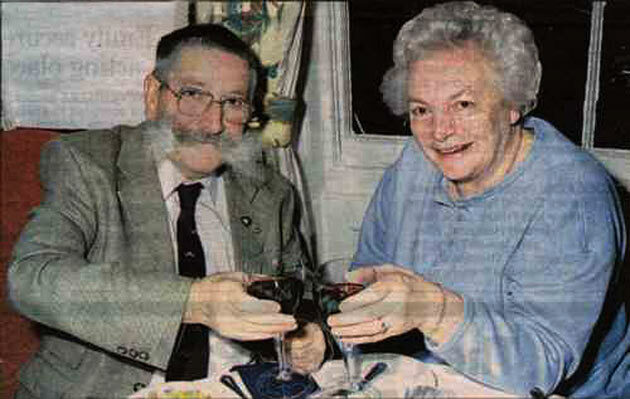 “Nevertheless Schnauzer - I will continue to honour him by using his anonymised Forum name - achieved great admiration from everyone on the Forum for his enviably-sized natural moustache, entertaining pictures of his activities and his confident and interesting posted remarks. “I hope he will forgive me for revealing these details now, simply because we all loved him and miss him, anonymous or not. “Schnauzer also acted as one of our volunteer Forum Moderators, with excellent even-minded and level-headed judgement of what was and wasn't appropriate material to be discussed in our specialist and classically English Gentleman's style-shop-window for the world. “Being on line with you all meant a great deal to him. It helped through some very hard days and he had lots of good laughs along the way. He felt that he knew a number of your club members. Please will you thank them all for their friendship on my behalf? 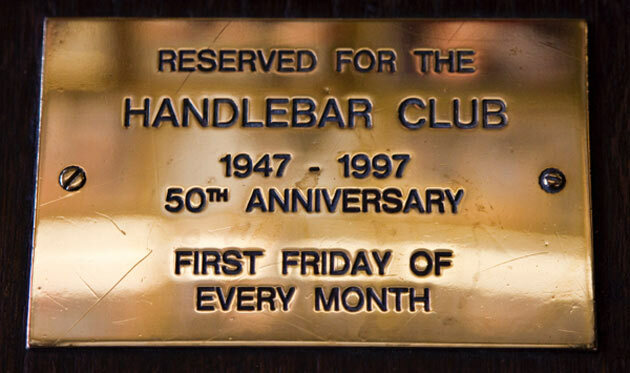 “I'm sure you will join me wherever in the world you are, in raising a glass to Schnauzer on Saturday at the Handlebar Club Christmas Dinner in Haslemere, Surrey, England, and then again on Monday next. “His funeral will be on December 14 2015 at 1pm Pacific time (8 hours behind us in the U.K). the funeral home will be live streaming the service. Please go to springfieldfuneralhome.com and follow the links to his name Gerald Klatt on their Web site. It will also be archived by them under his name afterwards. 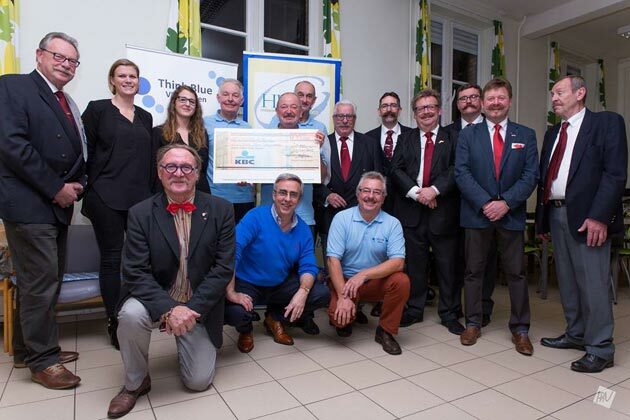 Club members Allan Robinson and Ryan Pike attended the West Vlaamse Snorrenclub on the 30th November 2015 in Bruges, Belgium to help present a cheque for €300 to mark the end of the Flanders Think Blue campaign. The charity helps raise both money for and awareness of prostate cancer in Belgium and a similar donation was made by the club at the annual Mussel Festival in September. Allan and Ryan (back row half-right) are pictured with members of the WVSC including Antoine De Bier (President, on left) and representatives of the charity. The evening was a great success, rounded off with some superb Belgian hospitality. On Saturday 14th, HBC club members James Dyer and Ryan Pike took part in the inaugural Capital Beards Beard and Moustache Competition in aid of Decembeard and the Charity Beating Bowel Cancer at The Hope Public House in Carshalton, Surrey. 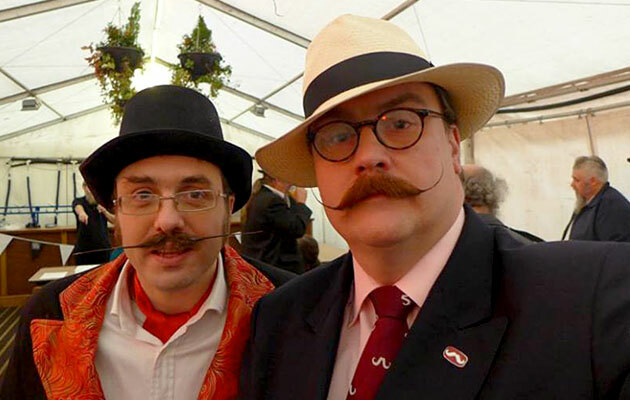 The event was quite small and Jim and Ryan were the only two moustache entrants, so they were hoping - TaDa! - to clear the awards between them. However, to provide a bit of friendly competition, Ryan waxed his moustache quickly between the categories and ended up winning both awards (Natural and Styled) and coming overall third best in show much to the chargrin of poor old Jim. Ryan has subsequently promised never to use wax again and will only ever enter the natural sections in the future (...or will he?). The Hope provided an excellent venue for real ale aficionados and not only had a superb selection of real ales but also ciders, perrys and a plethora of Belgian beers both in bottle and on tap. Johnny King Wins WBMC Dali Crown! Handlebar Club Member Johnny King dallies with Dali - and wins! 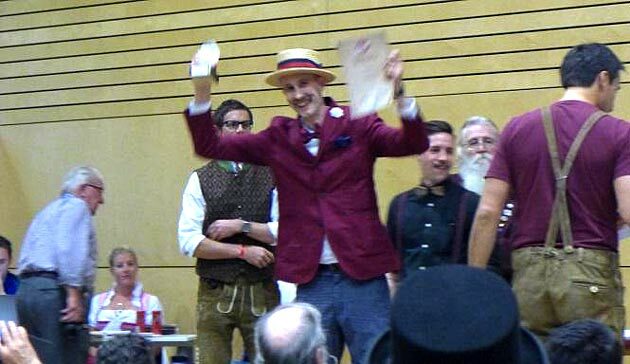 1st prize in the 2015 World Beard and Moustache Championships in Leogang, Austria goes to Handlebar Club Member Johnny King in a high-scoring triumph in the Dali Moustache category. Read Ryan Pike's illustrated report of the Alpine activities of The Handlebar Club's trip to the land of lederhosen and liquid lunches. We are sad to announce the death of André Acres, one of our Distinguished Members. “André was a member for about 60 years and our Treasurer for 30 years from 1968 until 1998. He claimed that he was only elected because he had short legs and couldn't run away quickly with the Club funds! “He and his wife Kath were stalwart members and attended most First Friday meetings for years until the travelling up to London became too onerous. They did continue to attend our AGMs until recently. “André’s health deteriorated and Kath was looking after him at home for his last 18 months. Unfortunately his health deteriorated still further and a few weeks ago his family decided that he could be cared-for better in a nursing home. 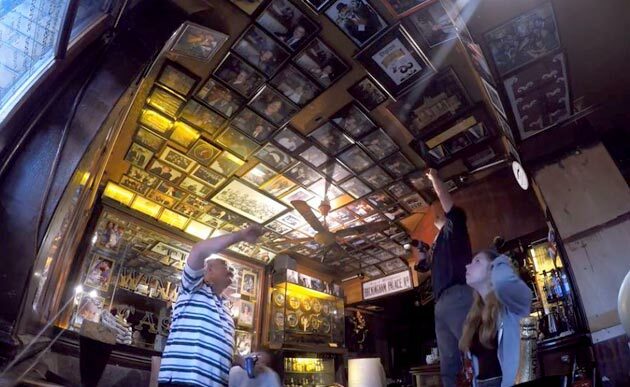 His room was made to feel like home and he was surrounded by pictures of his garden, and of course, Handlebar Club memorabilia. the eight leg, sixteen race yachting marathon. Club member Simon Rosbottom will be leaving these shores on Sunday 30 August from London's St. Katharine Docks, competing in the Clipper Round the World Yacht Race. He is sailing with the Great Britain team in this eight leg, sixteen race marathon. 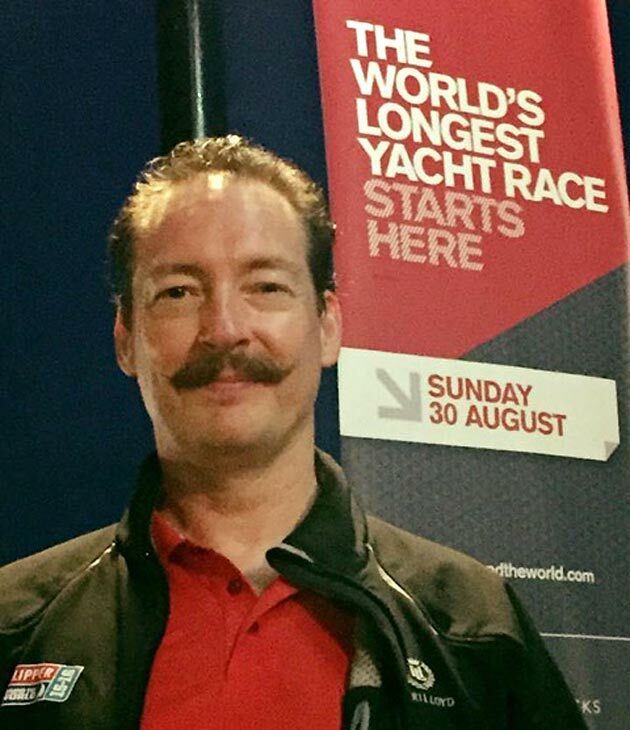 This must be the first time a Handlebar Club member has raced around the world in a yacht, so we wish him well and look forward to the Club Tie appearing in photo opportunities around the globe over the next 12 months. Allan, Ryan and James claimed 1st, 2nd & 3rd places in the two Moustache categories. 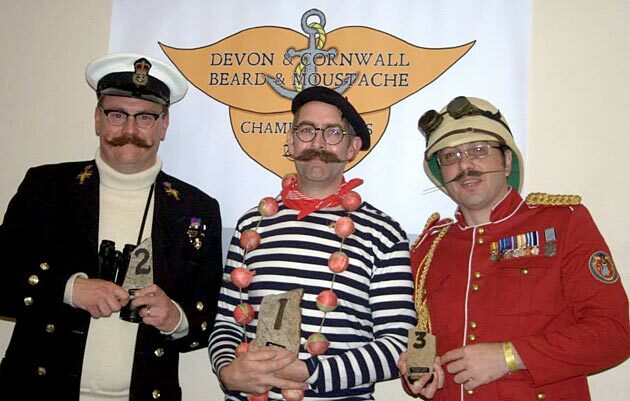 The inaugural Devon and Cornwall Beard and Moustache Championships were held on the 1st of August down at the Duke of Cornwall hotel, Plymouth. Organisers Clair and Mike Wellsbury-Nye did a cracking job in putting together their first event and it was duly supported by HBC members Allan Robinson, Ryan Pike, Mark Salisbury and James Dyer. The venue was superb as was the general atmosphere with Allan, Ryan and James claiming first, second and third places in the two moustache categories (Mark did not enter the competition although provided vital support). An excellent competition and everyone hopes that it will be on the calendar again next year. 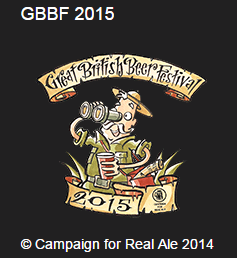 The Handlebar Club are proud to announce our annual outing to the Great British Beer Festival (GBBF), taking place on Thursday 13th August at Kensington Olympia, London. Featuring over 900 British and foreign beers, as well as food, music and beer-related paraphernalia, the festival is a well-established and extremely popular event. This year, to join us you can either purchase your tickets in advance for £10 each (or £8 for CAMRA members) by going to GBBF Web Site or alternatively queue at the door on the night and pay £12. Lastly, Thursday is of course officially designated ‘Hat Day’ by the Festival organisers, so I'm sure you'll dress appropriately. Members will be gathering from 6:30pm. 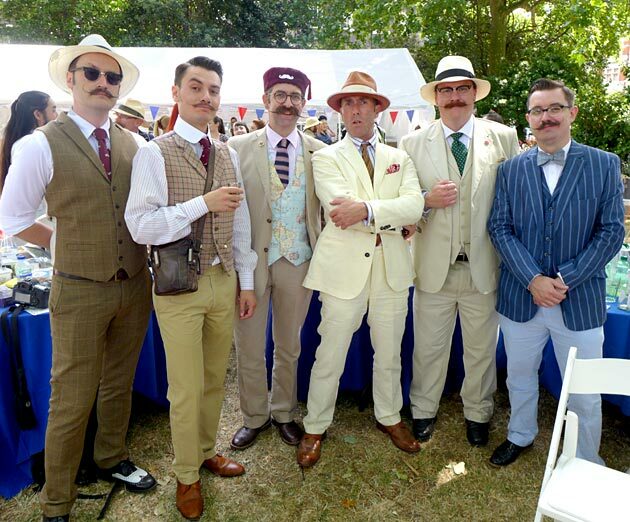 The HBC was represented at the 2015 Chap Olympiad by members Allan Robinson, Julien Sanchez, Russell Youles, Barry Copson, Tom Cutler, Ryan Pike, Gary McCann, Gary Gronnestad, Philip Smith and Soren Ragsdale. Pictured above are a few of the usual rogues with the man behind The Chap, Editor Gustav Temple (in cream suit!) who was keen to have his picture taken with the club. The Members excelled themselves in the final game of the day Not Playing Tennis where Allan and Ryan took it easy in a couple of deck chairs whilst Philip, Soren and Julien dismantled the entire tennis court and packed it away off stage. A resounding victory to end a fun packed day! 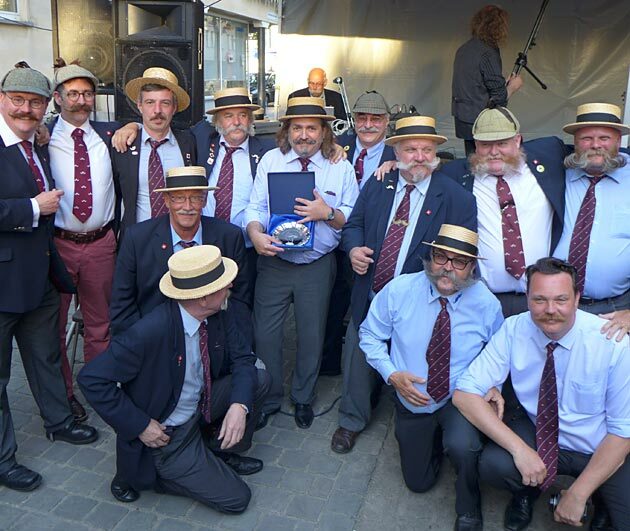 On the 27th June, Club members Allan Robinson, Julien Sanchez and Ryan Pike popped over to Brugge in Belgium to meet with the West Vlaamse Snorren Club for their annual Maatjesweekend or Herring Festival. 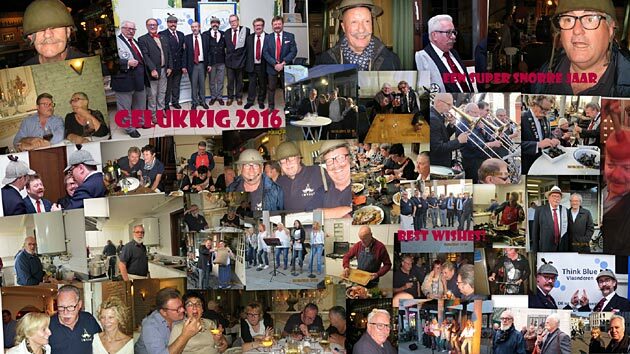 The weather for the trip could not have been better and the club staged the event in the historic Vismarkt (fish market) where the beer flowed all afternoon and a good time was had by all. A return trip is planned in September for the annual Mussel Festival which no doubt will be a very similar affair. The Handlebar and Deerstalker Club arrive in Antwerp. Rod, Alan, Ryan and Allan in full regalia. 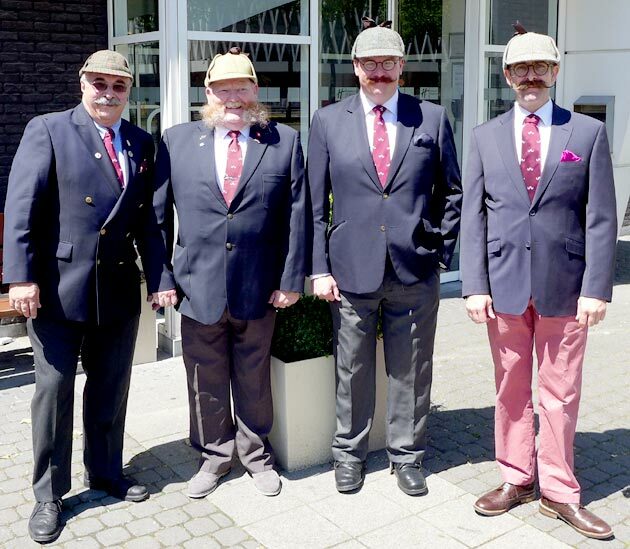 On the 5th June 2015, several HBC club members visited our friends at the Snorrenclub Antwerp for the Moustache of the Year parade which takes place every two years. This year the club was represented by President Rod Littlewood, Alan Spencer, Ryan Pike and Prime Handlebar Allan Robinson, pictured below in full regalia. A champagne reception was then held at the glorious town hall with the vice-Mayor of Antwerp (not the Mayor of Amsterdam, Alan) followed by live music and more festivities back at the bar, with a small detour to have a quick drink with the local constabulary. Rod presented Ronnie Vermeulen with an HBC salver. Later in the evening, Rod presented Ronnie Vermeulen with a salver from the HBC as a token of our appreciation for being invited to the event and for the Sterling work he had undertaken organising the whole affair. More excellent Belgian beer flowed and the party then went on in typical fashion to the wee small hours of the morning. 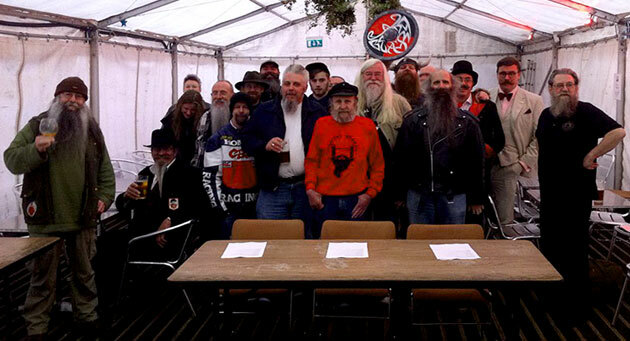 the Hitchin Beard and Moustache Competition. First Beard and Moustache Competition in Hitchin, Hertfordshire attracted Handlebar Club Members Chris Wall, James Dyer, Allan Robinson and Ryan Pike to try their luck again on the catwalk, having enjoyed acclaim at the Wessex Beardsmen's Competition in April. It was the very first beard and moustache competition in the town and was well supported; mounted by a beard and moustache grooming products company. “Me and Allan popped down to the World Pasty Championships in Cornwall and dressed for the occasion, became a bit of a tourist attraction. Give a unique Gift to the Moustache In Your Life! 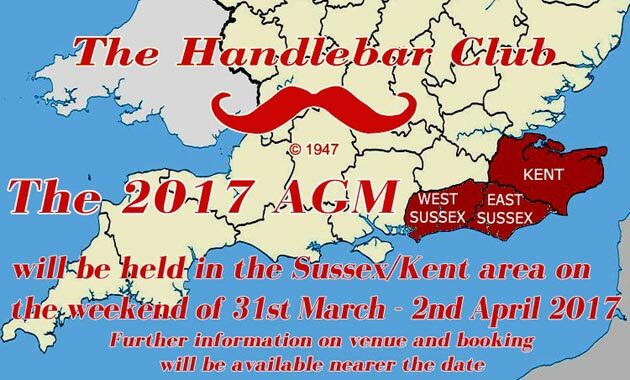 The Handlebar Club 2015 Calendar will give almost year of pleasure, and help Stepping Stones Down Syndrome Support Group into the bargain. Click / Tap on the picture to buy one now! The Handlebar Club 2015 Calendar is now ON SALE so if you're looking for a collectable and unique gift, click on the picture above and buy some. The Calendar is an A4 28 page saddle-stitched booklet with 12 glossy photos of the Handlebar Club members upholding the founding members’ idea of getting moustache wearers together for general conviviality. Prices are now down to £5.00 including P&P (UK only, for overseas shipping use the option to add £2.00 in the Shopping Cart) or pop along in person to the Handlebar Club First Friday meetings and the AGM and collect one for £5.00. All proceeds are going to Stepping Stones Down Syndrome Support Group. Members of The Handlebar Club attended the wedding of fellow member Aaron Burns to his Partner John Jones at St Andrews Church, Hove on January 31st. On the 31st of January members of the Handlebar Club Philip Smith, Russell Youles, Allan Robinson and the club's musical maestro Tom Carradine attended the wedding of fellow member Aaron Burns to his Partner John Jones at St Andrews Church, Hove. A fantastic day with a superb choir, a moving Aria, street fire dancers and an impromptu Cockney sing-a-long performed by Tom on the pub piano at the reception. A great day and we wish them all the best for the future! Tthe 2015 AGM weekend will be held at the Arundel House Hotel, Chesterton Road, Cambridge CB4 3AN, on the weekend of Friday 27th and Saturday 28th of March. Beautifully located overlooking the river Cam and open parkland, this 103 room hotel is only a short walk across the park known as Jesus Green, to the city centre and the wealth of fascinating architecture for which Cambridge is famous. There is a free car park and a bar serving draught ale. Members, their families and Friends gathered at The Shelleys Hotal in Lewes, East Sussex on Saturday 13th December, and enjoyed a pre-prandial pint (well, not the very young ones of course) in the bar lounge before sitting down to an excellent three-course Christmas lunch. Your reviewer and his companion chose the Duck Hash starter, which was a very tasty patty of shredded duck, bacon and potato surrounded by strips of braised cabbage, garnished with a light piquant sauce. The Traditional sliced Turkey breast with all the trimmings came next, washed down with an acceptable chilled Chilean Sauvignon Blanc from the Bar. The Finale was Traditional Christmas Plum Pudding, entertaining garnished with a half fresh strawberry, providing a much-needed citrus sting to counteract the sweetness of the surrounding Brandy Sauce. Handlebar Club President Rod Littlewood made a short speech thanking everyone for attending, and wished the present company and "all men (and women)" a Very Merry Christmas! Don't forget that The Handlebar Club 2015 Calendar is still on sale from our Big Cartel Shop so if you're looking for that inspired last-minute gift, click on the red link below and buy a few for friends. 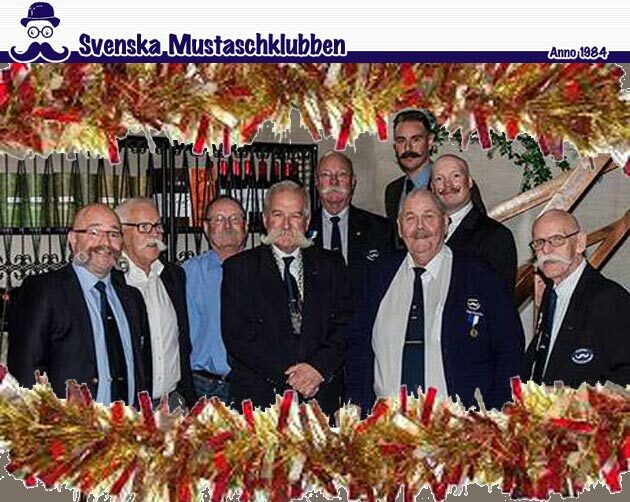 The Times of 10th November has published this photo-montage of Movember Mos attending our November monthly Windsor Castle pub First Friday meet - Photos by Matthew Lloyd. Can you name each of these gentlemen members of The Handlebar Club? 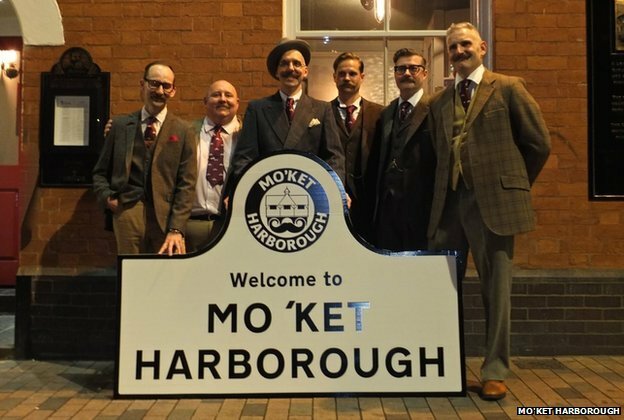 The town of Market Harborough has become the first place in the UK to change its name for Movember becoming Mo'ket Harborough, reports BBC News Leicestershire. “The Leicestershire town has a new sign and the building society has changed its name. It's Movember! Grow a moustache and raise awareness about men's health issues. 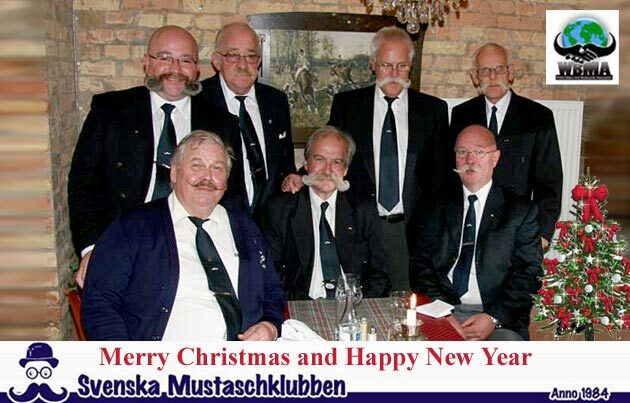 The Gentlemen of the Handlebar Moustache Club and The Chiswick Calendar wish you Happy Movember!